Vertical Machining Center is well suited for aerospace and other industries requiring full 5-axis capabilities. 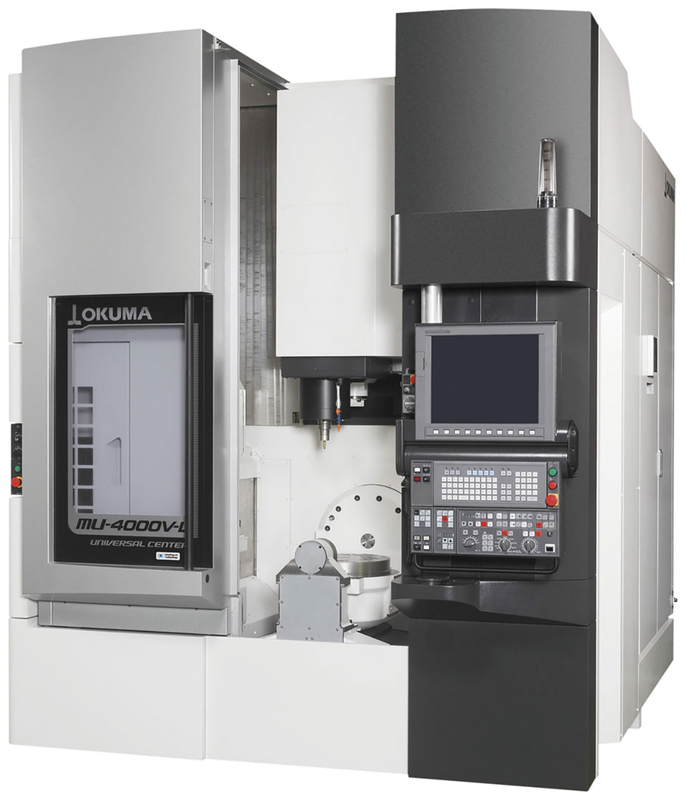 Okuma’s new MU-4000V is excellent for 5-axis multi-sided machining and is well suited for the aerospace and die/mold industries. It provides high speed, process intensive machining combined with turning and 5-axis multitasking machining. This versatile machine features a large work envelope and substantial base in a compact footprint. Its sturdy design boasts a machine mass of 9,700kg and the B-axis trunnion is fully supported so there is no overhanging mass. Fully supported axes construction allows for a broad scope of spindles ranging from 12K to 25K RPM to efficiently handle complex and difficult to machine materials. The unique and automation friendly design places the pallet changes at the back of the machine, allowing easy connection to a PALLETACE flexible manufacturing system or pallet pool, delivering high productivity in addition to high accuracy. ATC’s can be configured to meet growing demands with 32 to 64 tool chain magazine systems and 64 plus matrix cabinets. The MU-4000V can be equipped with Okuma’s exclusive Super-NURBS function, enabling high feed rates and ultra-fine finishes. Built using Okuma’s Thermo-Friendly Concept, this 5-axis machining center performs consistently from the first part to the last, regardless of warm up time or ambient temperatures. Standard 5-Axis Auto Tuning System technology automatically measures and compensates for up to 11 geometric errors to ensure precision machining. The MU-4000V was named one of the Best 10 New Products of 2015 by Nikkan Kogyo Shimbun’s Business & Technology Daily News. For more information on the MU-4000V visit http://www.okuma.com/mu-4000v. For larger 5-axis parts, the MU-V series also includes the MU-6300V and MU-8000V.